An NBA player who once played for the Knicks and his girlfriend were stabbed outside a popular nightclub in Chelsea early Wednesday, and two other players were arrested when they tried to intervene, police and sports representatives said. Indiana Pacers forward Chris Copeland was stabbed in the left elbow and abdomen after leaving the 1OAK nightclub on West 17th Street with his girlfriend, Katrine Saltara, at about 4 a.m., authorities said. Saltara was stabbed three times -- in the arm, chest and buttocks -- and a 23-year-old woman with the alleged attacker was slashed twice in the fray as well. Police had identified Saltara as Copeland's wife; his agent later clarified they are not yet married. Sources tell NBC 4 New York that Copeland and Saltara were arguing outside the club when a woman approached and tried to intervene. Copeland then began arguing with a man who walked up to them, and Saltara and the other woman tried to break up the fight. Shezoy Bleary, accused of stabbing former New York Knick and current Indiana Pacers forward Chris Copeland, is led from a police stationhouse after his arrest Wednesday. The suspect, identified as Shezoy Bleary, allegedly pulled out a knife and started slashing people, cutting the 31-year-old basketball player, his girlfriend and the other woman, believed to be a friend of Bleary's. The second woman was stabbed in the chest and the abdomen. A livery driver pointed out the alleged attacker when police arrived and Bleary was taken into custody. A knife was recovered at the scene. Police said charges were pending against him. It wasn't clear whether Bleary had an attorney who could comment on the charges. He did not comment to reporters as he was led from a police station Wednesday evening. Copeland, his girlfriend and the second woman were taken to hospitals in stable condition. Two other NBA players, the Atlanta Hawks’ Pero Antic and Thabo Seoflosha, were arrested on obstructing governmental administration and other charges after they allegedly blocked police who were attempting to set up a crime scene. Antic also allegedly grabbed and shoved an officer who was trying to get him to step back. Antic and Seoflosha had come to the city following a game in Atlanta Tuesday night. The Hawks are set to play the Nets at Barclays Center on Wednesday. They were released on their own recognizance after a joint arraignment Wednesday afternoon. Their attorney, Alex Spiro, said the players "should not have been arrested" and that he expected their case to be dismissed. The Hawks said neither Antic nor Sefolosha would play against the Nets. Sefolosha was limping during his court appearance and Spiro said he had been injured during the arrest. Coach Mike Budenholzer said the reserve would have his ankle checked. Antic and Seoflosha said in a statement: "As members of the Atlanta Hawks, we hold ourselves to a high standard and take our roles as professionals very seriously. We will contest these charges and look forward to communicating the facts of the situation at the appropriate time." Head Coach Mike Budenholzer added that the organization "will support them through this process." 1OAK said it is cooperating with the NYPD, adding that the disagreement that led to the stabbing doesn't appear to have originated from inside the club. Copeland is originally from Orange, New Jersey, and played basketball for the University of Colorado and in Europe before joining the Knicks in 2012. He played one year for the team before signing with the Pacers in 2013. Copeland’s team was in Manhattan for a matchup against the Knicks at Madison Square Garden Wednesday night. Pacers president Larry Bird said in a statement released on Twitter that the team was aware of the altercation. 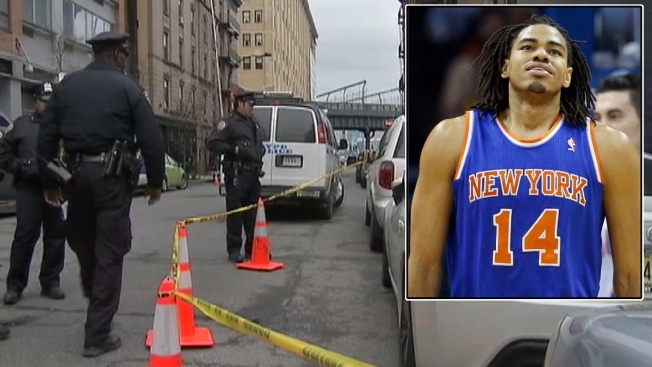 "We are aware that Chris Copeland was injured early this morning in New York City," the NBA Hall-of-Famer said. "We are still gathering information and will update when we know more. Our thoughts are with Chris and those injured." Pacers head coach Frank Vogel told reporters he learned about the stabbing in an early-morning phone call and that he went to visit Copeland in the hospital after he underwent surgery on his elbow. "Obviously, it's on everybody's minds, but we're in a fight for the playoff spot," he said. Vogel wouldn't say whether the team has a curfew, but player Solomon Hill said during practice there wasn't one. "We're grown men, you don't try to tell people what to do in their free time," he said. "We just try to say a prayer for him and look forward to him coming back." Copeland has played infrequently, missing 21 games since Jan. 31. With All-Star Paul George making his season debut Sunday, Copeland's already limited minutes were expected to get cut. -- Katherine Creag contributed to this report.